Ingredients: Aqua (Water), Glycerin, Stearic Acid, Pistacia Lentiscus (Mastic) Gum, Centaurea cyanus flower water, Sapindus Mukurossi Fruit Extract, Niacinamide, Alcohol, Honey, Coconut Acid, Magnesium aluminum silicate, Arginine, Bentonite, Butyl Avocadate, Ethyl Linoleate, Hydroxyethylcellulose, Lecithin, Phospholipids, Acacia Senegal Gum, Carrageenan, Citric Acid, Propyl Gallate, Ethoxydiglycol, Lactobacillus Ferment, Potassium Sorbate, Sodium Benzoate, Phenoxyethanol, Chlorphenesin. 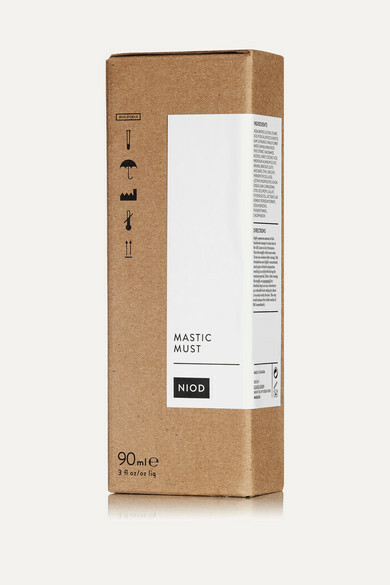 NIOD's 'Mastic Must' mask is made from a dense sap sourced from Greek mastic trees that binds to congestion and shrinks enlarged pores and blackheads without drying the skin. This anti-bacterial and anti-fungal product is sustainably sourced and expertly purified in a bio-technology lab. Your skin will feel instantly refreshed, refined and smooth.